These days the friendly skies are getting a little less friendly and little more intrusive. Will less privacy mean safer skies? 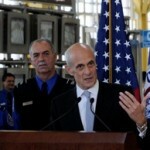 ARLINGTON, Va. — The Department of Homeland Security will take responsibility from airlines for checking passenger names against watch lists beginning in January and will require all commercial passengers for the first time to provide their full name, date of birth and gender as a condition of boarding a flight, U.S. officials said today. The changes will be phased in next year for the 2 million passengers each day aboard domestic and international flights to, from or over the United States. It marks the Bush administration’s long-delayed fulfillment of a top aviation security priority identified after the Sept. 11, 2001 terrorist attacks, an effort that has long spurred privacy concerns. 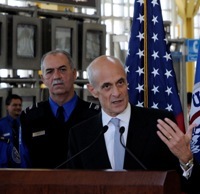 Speaking at Reagan National Airport, Homeland Security Secretary Michael Chertoff and Transportation Security Administration chief Kip Hawley said that by gathering more personal information from passengers, the government will dramatically cut down on instances of mistaken identity that have wrongly delayed travelers or kept them off flights. Posted: 10/23/08 at 1:31 AM under News Story.